A man, who lashed off a boot/clamp from his car with a sledgehammer Tuesday evening, is worried about a square off between members of the Guyana Police Force and City Police. “In light of the back-and-forth, I am worried that the Mayor and City Council, the police and the constables will have a shootout on the street. I am afraid of coming to Georgetown tomorrow (Wednesday),” Mr. Rodrigues told Demerara Waves Online News. The businessman said he was not comforted by Cabinet’s latest decision on Tuesday, given the dismal track-record of City Hall and Central government over the last few months in addressing concerns about the parking meter contract. 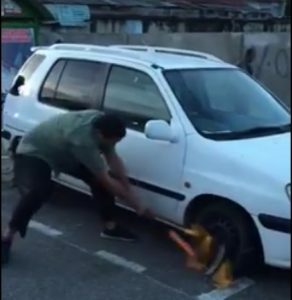 Rodrigues, who owns a store on Regent Street, said his frustration about the mixed signals and lack of action to relieve citizens of the parking meter system, armed himself with a sledge hammer and lashed off a boot/clamp from his car that was parked outside the Regent Multiplex at Regent and Wellington Streets. “I am on the edge of losing my mind. I owe my creditors, business is bad and I realise the government is incapable of helping the people and the Mayor and City Council has in took it upon its own to oppress the people in support of Smart City Solutions and I have to take things into my own hands,” he said. Asked why he did not challenge City Hall/ Smart City Solutions in light of the Minister of Communities, Ronald Bulkan’s order to suspend the parking meter bylaw, Rodrigues said he had no faith in the legal system because there are a number of parking meter court cases before the court. “I just got frustrated and was incapable of seeing any other way out,” he said. The businessman said SCS representatives took up their clamp and he was about to be approached by a City Constable when he drove off.. He said he was not encouraging people to destroy the booting devices, but they should speak out against the perpetrators of injustice. Just before breaking off the booting device from his car, he said “I am planning to take care of myself from now on and I hope every Guyanese who wants to be a free Guyanese take up the opportunity to take care of themselves because the government of this country and the ministers of this country have left people to the mercy of Smart City Solutions,” he said. Two hours after Rodrigues removed the device, the Ministry of the Presidency issued a statement expressing disappointment at the Georgetown City Council’s actions on Monday when it refused to heed Bulkan’s earlier order to suspend the parking meter bylaw. Government wants the project suspended for 90 days to pave the way for the contract to be renegotiated with the aim of addressing the public’s concerns about the parking rates, lack of transparency and accountability. The Movement Against Parking Meters, however, maintains that the contract must be revoked because there was no public tender, public consultation and socio-economic impact study. The Movement has been stressing that it is not opposed to parking meters but the manner in which it was introduced here was bad. City Hall sees paid parking as a route to garner quick financing to fix roads, bridges and the drainage system as well as collect garbage. The Ministry of Public Infrastructure last week outlawed the erection and operation of parking meters on several streets, including Water Street, that government says are not the City’s responsibility. M&CC and SCS representatives were up to Tuesday still working on Water Street.